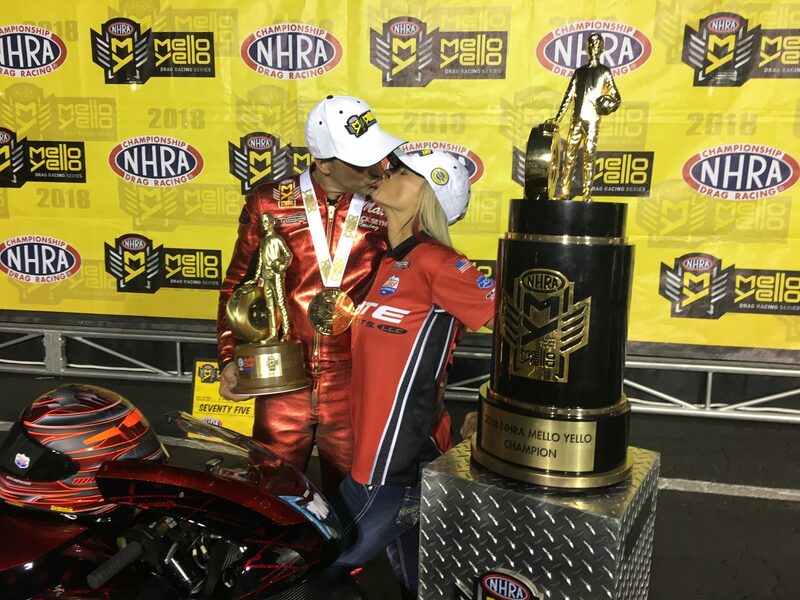 Matt Smith secured his third NHRA Mello Yello Drag Racing Series Pro Stock Motorcycle world championship in the final round of eliminations Sunday at the Auto Club NHRA Finals at Auto Club Raceway at Pomona. He powered his Elite Motorsports DENSO Auto Parts EBR to a 6.765 at 201.22 national speed record pass to defeat defending world champion Eddie Krawiec, who was the nearest championship contender. M. Smith defeated Angie Smith, Hector Arana and LE Tonglet en route to the finals to secure the championship and event title. This is his first world championship title since 2013. 196.62 def. Ryan Oehler, Buell, 6.927, 194.46; Andrew Hines, Harley-Davidson, 6.822, 197.13 def. Steve Johnson, Suzuki, 6.976, 192.36; Hector Arana Jr, 6.827, 197.28 def. Freddie Camarena, Suzuki, 7.029, 192.77; Eddie Krawiec, Harley-Davidson, 6.802, 197.54 def. Karen Stoffer, Suzuki, 6.937, 192.66; Matt Smith, 8.367, 111.80 def. Angie Smith, Buell, Broke; QUARTERFINALS — M. Smith, 6.795, 200.29 def. Arana, 6.869, 195.22; Arana Jr, 6.944, 193.77 def. FINAL — M. Smith, 6.765, 201.22 def. Krawiec, 6.812, 198.35. 1. Matt Smith, 2,666; 2. Eddie Krawiec, 2,627; 3. Hector Arana Jr, 2,536; 4. LE Tonglet, 2,532; 5. Jerry Savoie, 2,464; 6. Andrew Hines, 2,450; 7. Angelle Sampey, 2,349; 8. Angie Smith, 2,303; 9. Steve Johnson, 2,290; 10. Scotty Pollacheck, 2,258.